High-resolution endoscopic ultrasound (hr-EUS) with miniprobes performed during diagnostic endoscopy yields information on invasion depth of early cancer and on lesions arising in intramural echo structures. 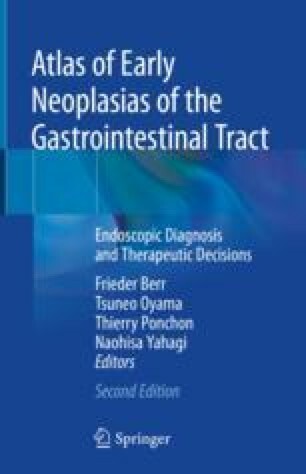 This chapter explains the diagnostic characteristics of hr-EUS images of early mucosal neoplasias and of the most prevalent types of intramural tumors. Imaging by hr-EUS characterizes subepithelial tumors for size, invasiveness, and wall layer of origin, and distinguishes superficial mucosal neoplasias from deeply submucosa-invasive early cancer with about 90% accuracy in most locations of the GI tract. Hr-EUS imaging should be available when the decision is taken between endoscopic or surgical resection for subepithelial tumors or for superficial versus submucosa-invasive early cancer.